When our brownstone was built 100 years ago there was, of course, no such thing as cooling systems so when deciding what HVAC system to install, we had to make some compromises. Our three options were: central air conditioning, a ductless split-AC system and window or sleeve mounted units. Window or sleeve mounted units: No. We have lived in many apartments that had window mounted AC’s and they were always loud and they blocked light and well they are just plain ugly. Our condo had the units that fit into a wall sleeve but they were unsightly on the outside of the building and there is little selection depending on what size sleeve you had. We bought one new and it was very loud and was still fairly large as it protruded from the wall of our already small bedroom. Central Air: The plus to this option is obviously that there are no visible units as they are built into a duct system. With this option, if you are remodeling an old house you must consider that it was not designed to have duct systems. These might interfere with ceiling and wall moldings or other period details. In our opinion, this is the best option if you are gutting your home because they can custom design the ducts in the least intrusive way. The other downside to this system is that it can be the most expensive. Split AC Systems: This is the one we chose. Since ours was not a gut renovation, we were concerned about creating a system of ducts. The plus side to these systems is that they are very quiet and cool each room separately. With central air, most systems are designed so that you set the temperature by zone or even for the entire house. That means you are cooling more of your house than you need to and that is costly. With a split AC, if you want to cool say only the bedrooms at night you can, which makes this cheaper to operate. It also has a heat function so that if you a blast of heat in one room you can. This might come in handy since the front of the house gets sun all day while the back of the house does not. The down side is that even with the unit attached high on the wall, the in-room units are still pretty big, bulky and I’ll admit it, ugly. First, you need to install the compressor. We considered putting it in the backyard but did not want to deal with a loud hot compressor next to our patio. We ended up putting it on the roof so it would be completely out of the way. 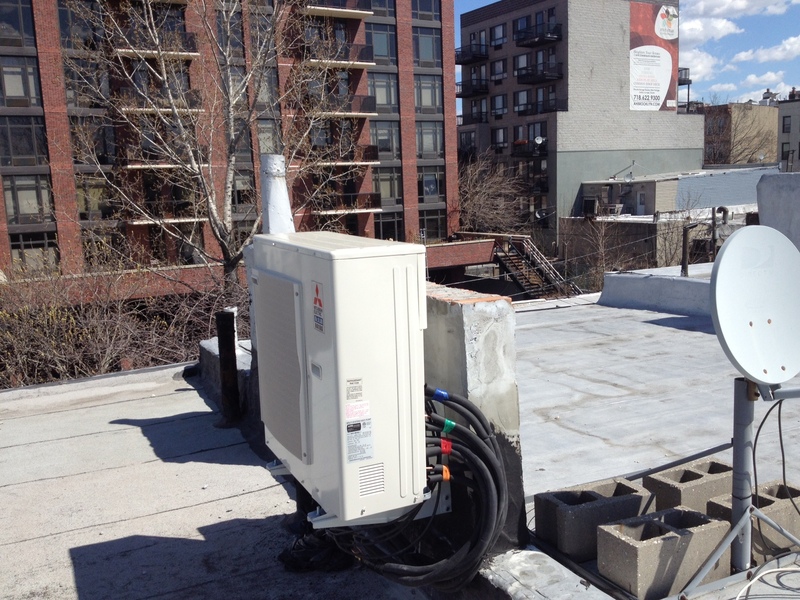 When installing the compressor on the roof you have a few options. The DOB does not allow it to be mounted directly to the roof. Instead you must put steel bars across your roof parapets or mount it directly to your roof parapet on a rack. The parapet mount is much more economical assuming your parapet is high enough. If not, you can extend it a few feet with some CMU blocks as we did. This is still more economical than the steel bars. We chose a 4 zone single compressor Mitsubishi system and hired a separate plumbing company to install it (our contractor did not have a particular expertise in this area – don’t ask). Next, each wall unit is installed. Even though you are not creating ducts you still need to open walls and install some plumbing. There are coolant feed and return lines that run from the compressor to each unit as well as a power cord and a condensation drain. The condensation drain runs from the wall unit down to your building’s waste line. All the units were installed this week, which is great because now walls can be closed and finished. Next to the extension, this was the next big hurdle to jump. Here are a few photos of them installed. We tried to put them in the least intrusive spots. We are not very happy with the parlor floor unit. It sticks out like a sore thumb. There really were no other options so we will have to live with it. The other units were placed so that they could not be seen when you first enter the room. Parlor floor – sticks out like a sore thumb but not much we could do. Just don’t look at it from the side! Maybe me can grow some ivy around it or something.